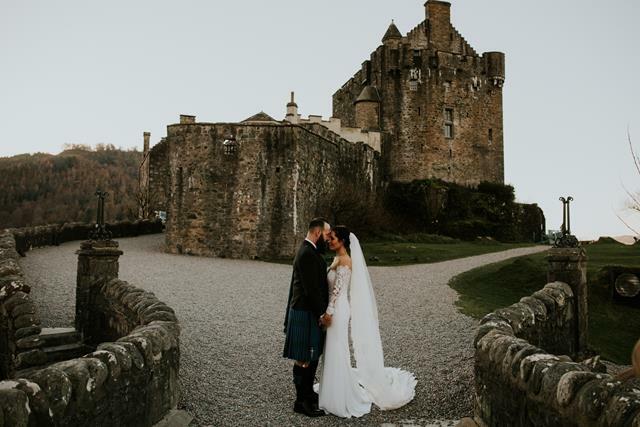 Today we are featuring our beautiful bride Katrina in Pronovias. 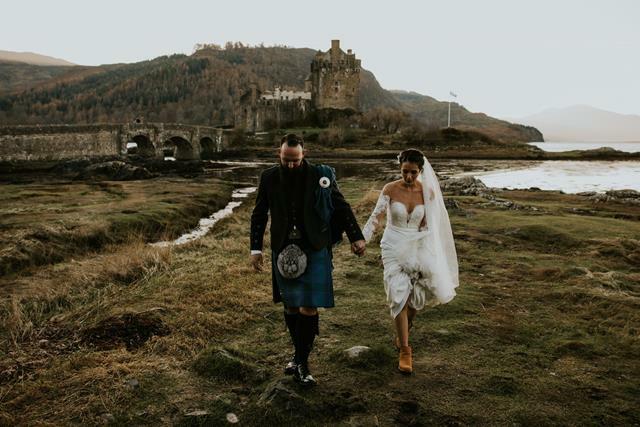 Her wedding was on 17th November 2018 at Eilean Donan Castle, Dornie (Ceremony) + Duisdale House Hotel, Isle of Skye (Reception). 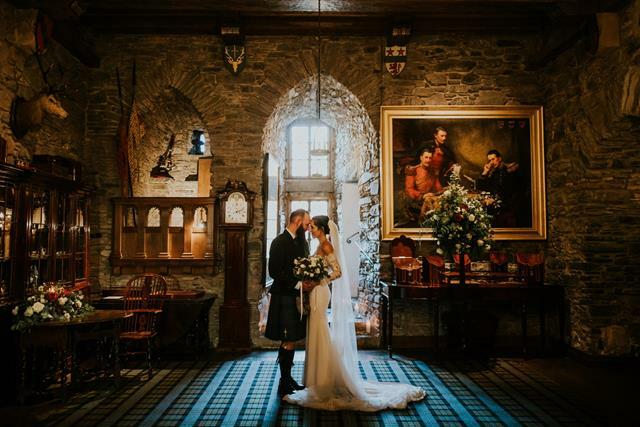 the beautiful photos are by John Johnston. 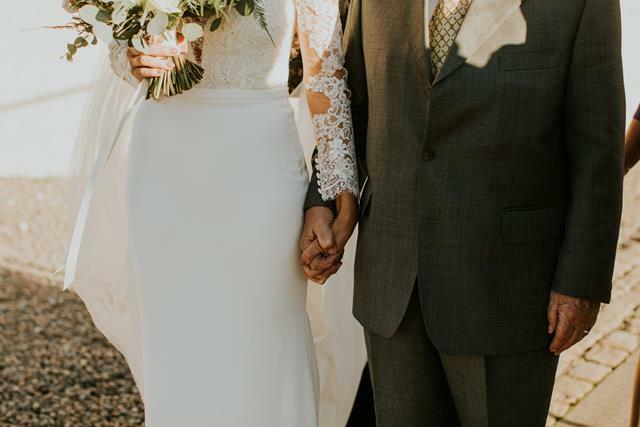 I started to look for my wedding dress back in September 2017, and Brides of Winchester was the fist bridal store to visit on my list. Little did I know it would be the only bridal store I would visit and that I would put a deposit down on a dress on the same day! 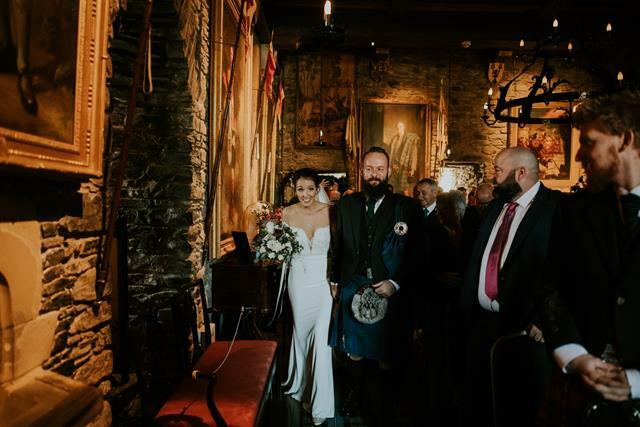 One of the reasons why I chose Brides of Winchester in the first place was that they were a stockist of my dream dress – Naomi Neoh’s ‘Fleur’ – and I just needed to try it on!! It was the first dress that I tried on…..and, well, it just wasn’t right!! It was just too big and just too heavy. About 5 dresses later, and with options running out, I randomly saw the Pronovias ‘Dracma’ dress hanging up and decided to try it on. 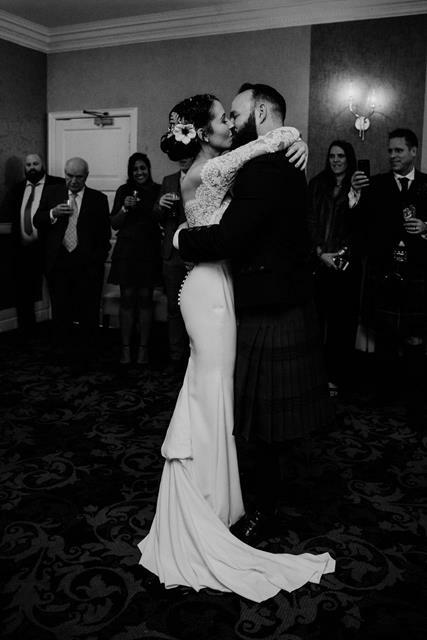 When people say to you about trying on your dress ‘when you know, you just know’, they are absolutely right. 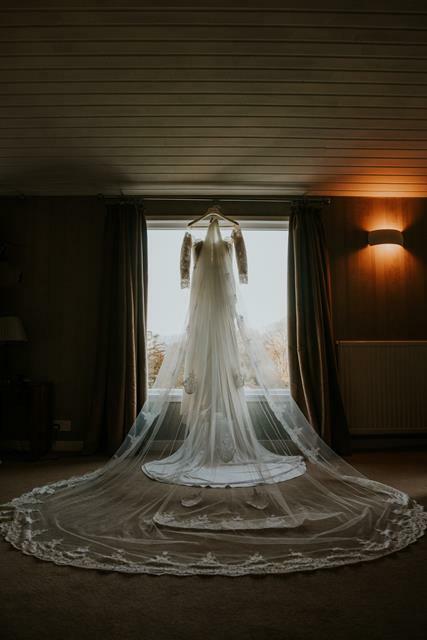 As soon as I put the dress on and saw myself in the mirror, I knew it was the one and fell in love with it instantly. 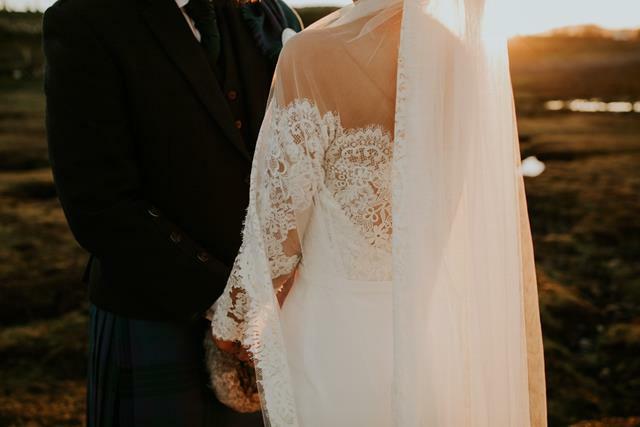 Not to mention the most amazing full length Pronovias viel to go with it. 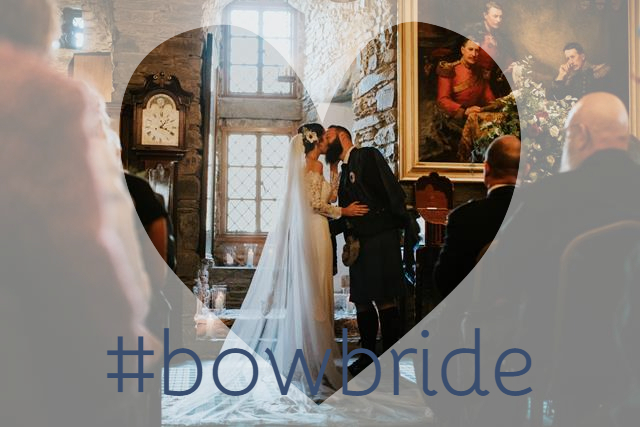 The whole experience with BOW was just a dream. I actually found John by scrolling through Instagram! 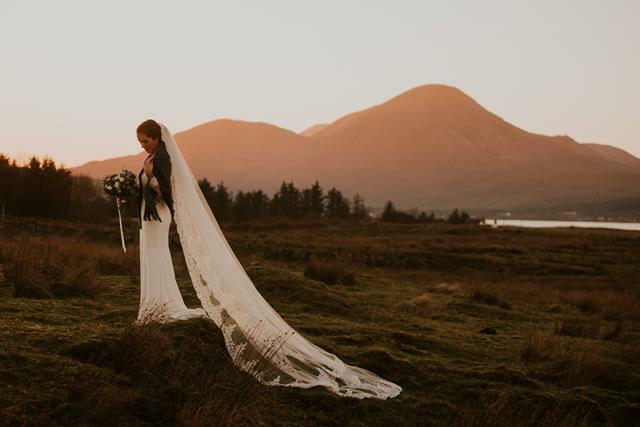 As the wedding was being held right up in the North Highlands of Scotland where the landscape is at it’s most dramatic, the most important thing for us was to find a photographer who captured both the day and also the landscape. 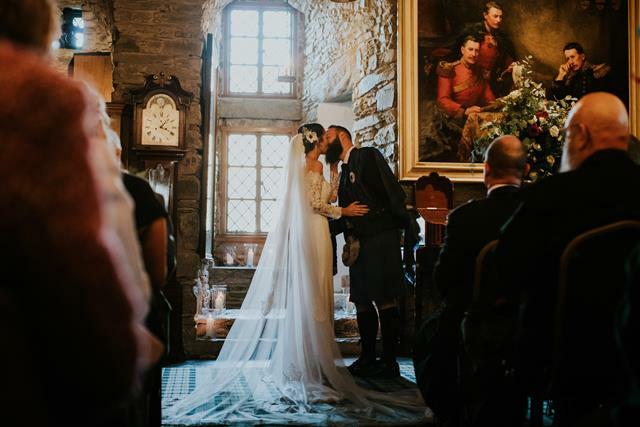 I saw that John had documented a wedding at our venues previously and I fell totally in love with his images the first moment I saw them, and I knew that we had to have him capture our day. He was a true ‘photo ninja’ and just blended in with the other guests and we really did not know he was there. Such a professional and lovely guy. 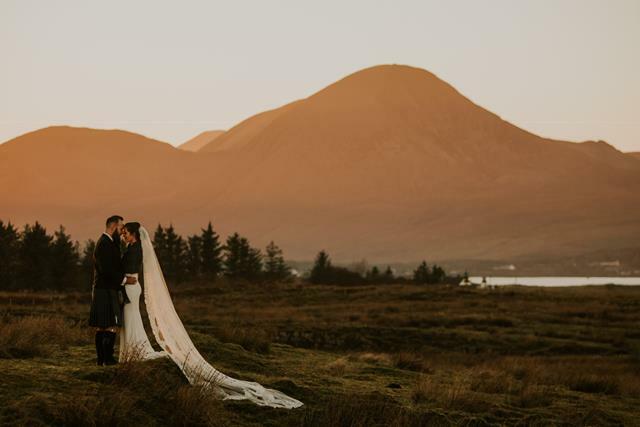 He has such a passion for landscapes and photography, and that really shines through in all our pictures. 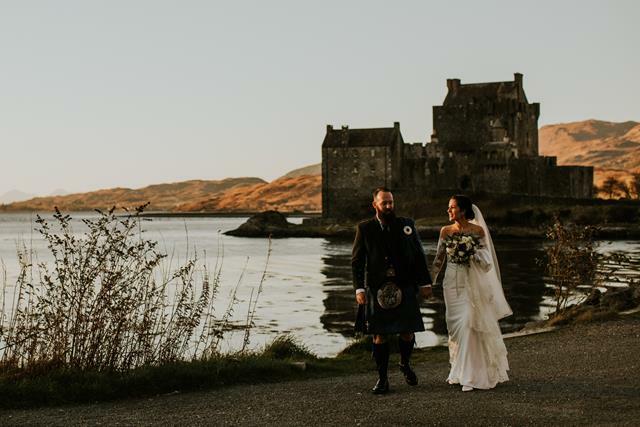 My Granny is from the North Highlands of Scotland and I have quite a lot of family dotted around both the East and West coasts, so holidays as a child were always spend in Scotland. 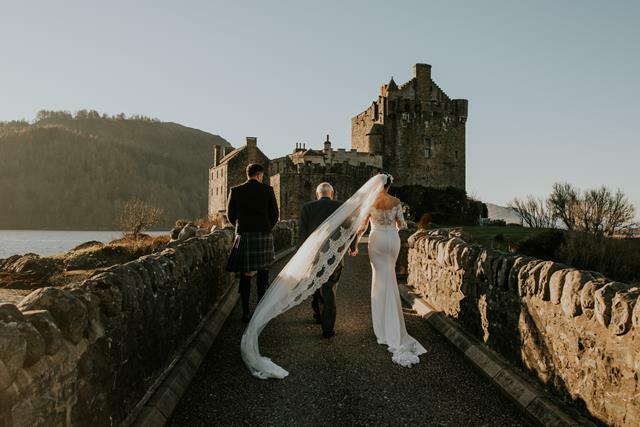 Ever since I was little I had been taken to see Eilean Donan Castle and I have always said that I would get married there one day. 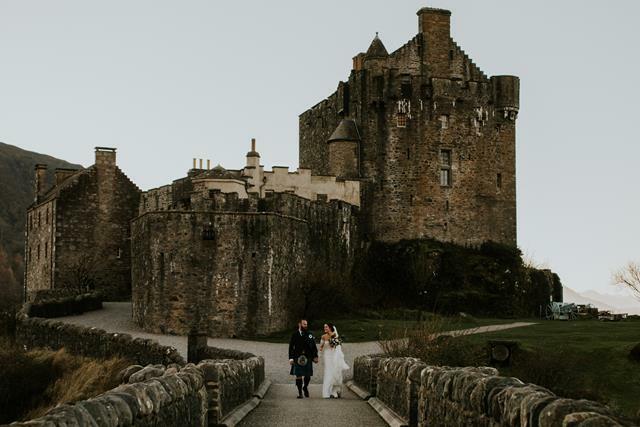 It is just the most amazing, most special place, and so it was such a dream come true to be able to get married there. 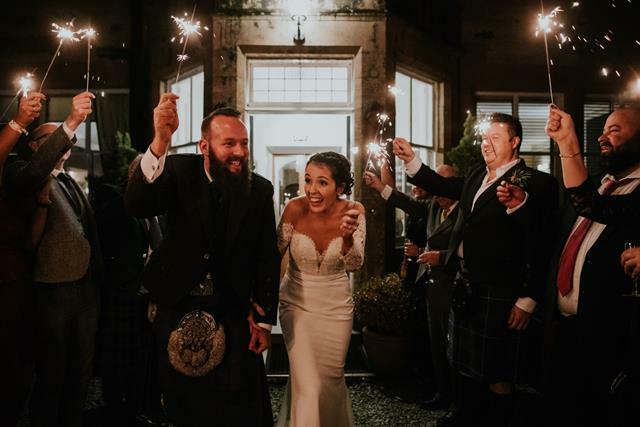 James and I picked Duisdale House Hotel for our reception venue after spending James’s 30th birthday there back in 2015 and we both fell in love with it. The staff were amazing and so attentive, and the views are just stunning. 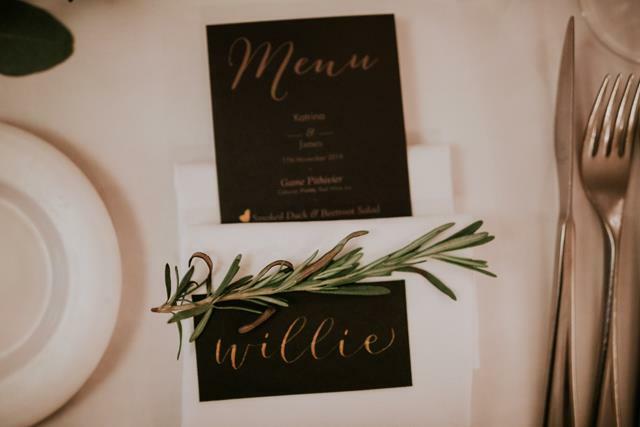 I had always wanted the colours black, gold, and green to be incorporated into the wedding. The only other things important to me was to have lots of flowers and candle dotted around. 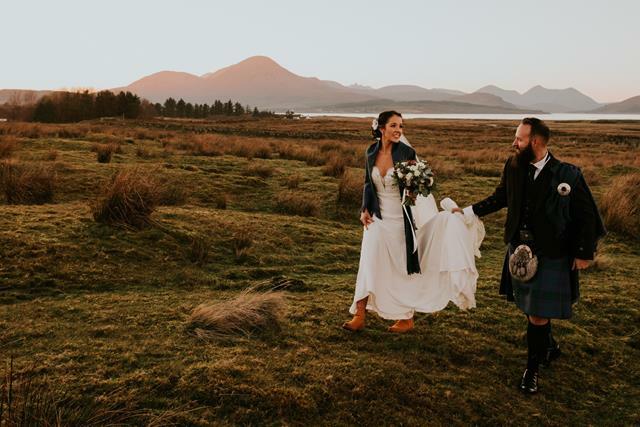 With it being a winter wedding, I didn’t want bright colours as they wouldn’t have sat well with the colours of the Scottish landscapes! So, somewhat controversially, I wanted the bridesmaids to be in black. I decided on choosing multiway dresses for the girls so they could wear them in a style that they were comfortable with, and also I didn’t all want them to look the same. 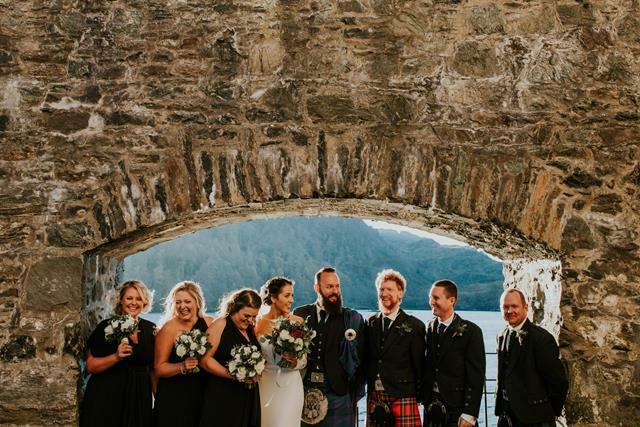 James and his Groomsmen were wearing kilts which looked absolutely fab! 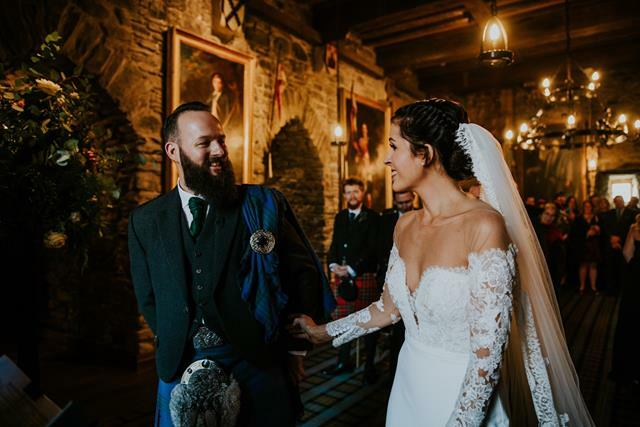 You are in Scotland after all  I had a lot of greenery incorporated in my bouquet and lots of candles in lanterns around both the castle and the hotel. All the stationary was done in black with gold writing. I got loads of my ideas through Pinterest! We came across a pub close by to the hotel getting rid of 10 whiskey bottles which we decided to take as we thought they would work as decorations. 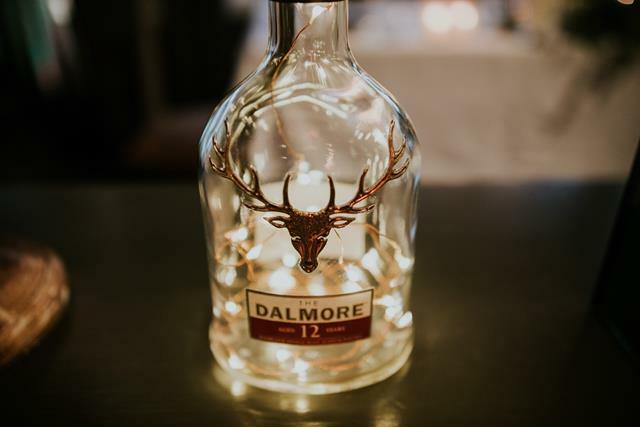 We brought some lights which we put inside…very simple and effective!! 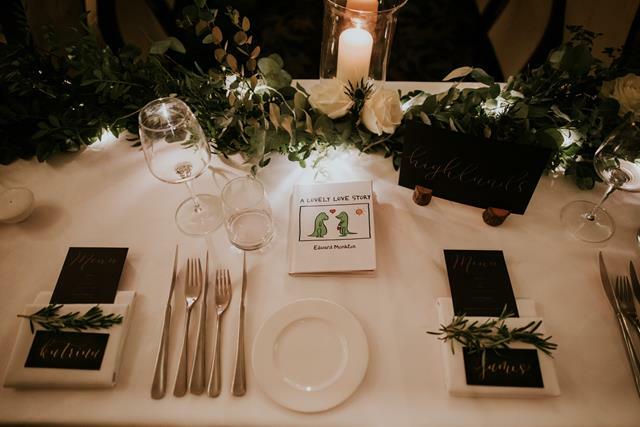 With it being a destination wedding, you cannot decorate too much as it would cost a fortune getting all the decorations there and back, so I had to choose carefully on what was important to us! 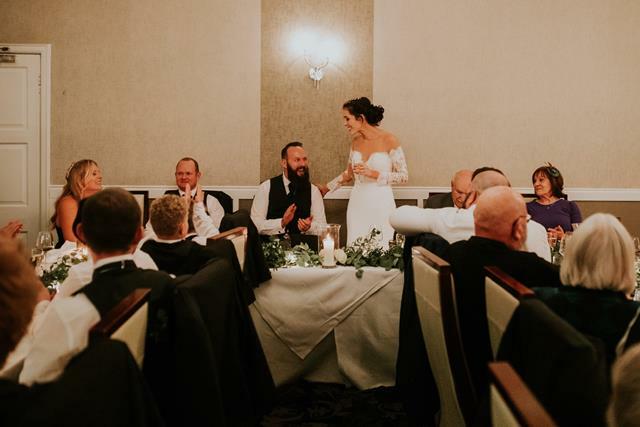 I was recommended CP Flowers from another florist based near to our venues, and am so glad I was! Caroline was perfect to work with and such a lovely lady too. 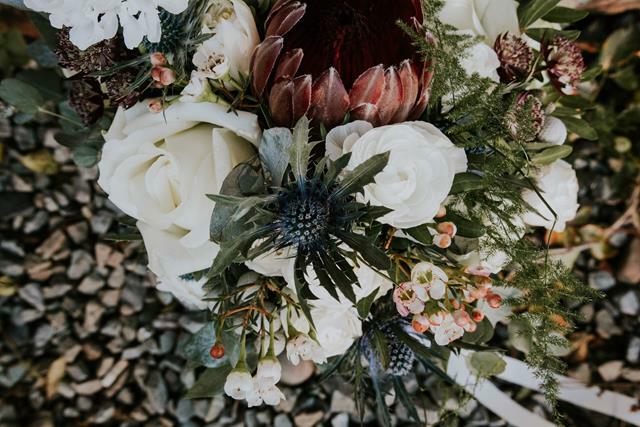 In my initial request I said I wanted white roses, Scottish thistles, lots of greenery, and proteas. James is South African and the protea is their national flower so it seemed fitting! Caroline did such a lovely job with my very vague request, and so much more than what I had ever invisioned. My bridesmaid’s each had a smaller version of my bouquet but without the proteas. Caroline did the most perfect job with creating the dining room I had always dreamed of. It was very simple but very effective. 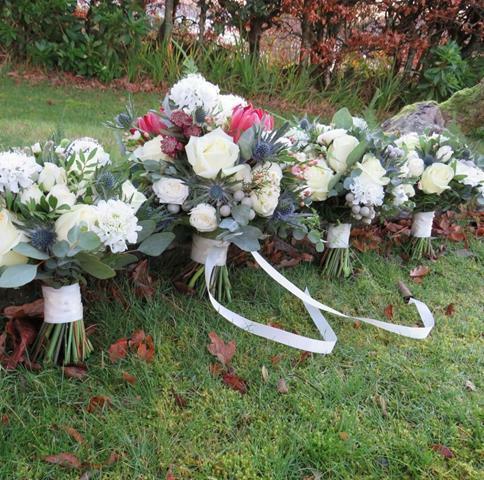 We had long pieces of greenery down the middle with white roses and fairy lights down it, with added candles. 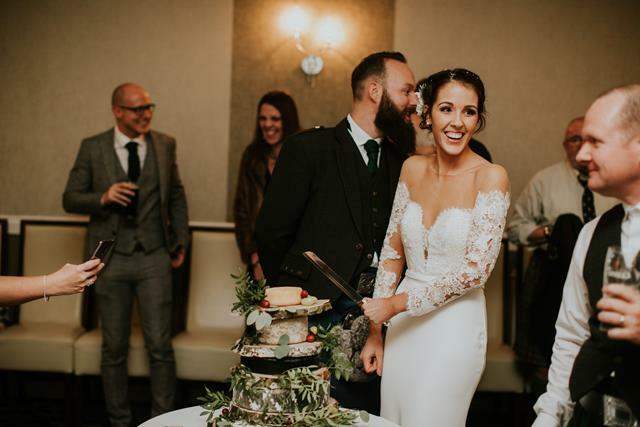 We decided not to go for the traditional cake, and decided to go for tiers of cheese instead! We are both lovers of cheese and we thought that it would be nice to have something different. 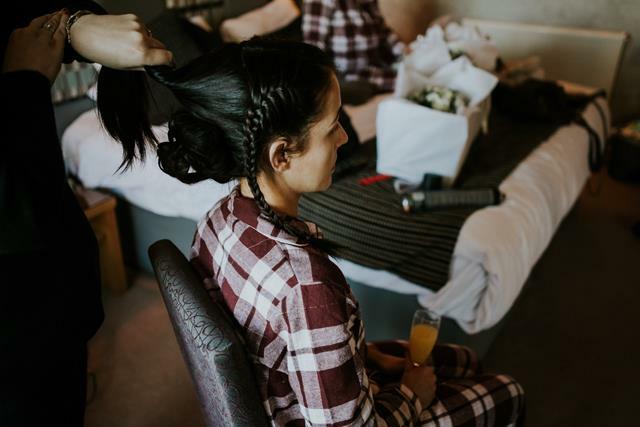 I remember waking up in the morning of the wedding with my bridesmaids and I was just feeling excited! The morning just went so quickly that I didn’t have time to be nervous. 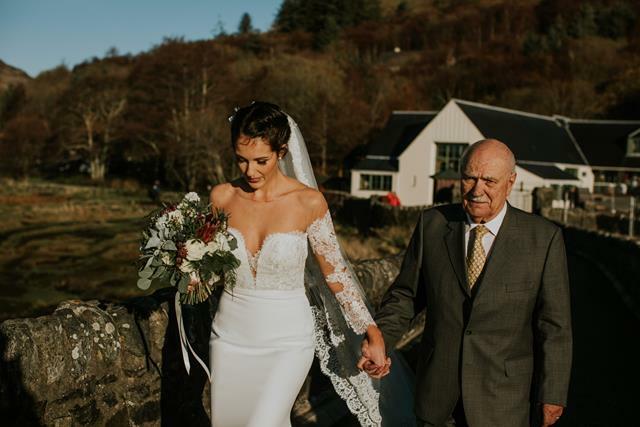 Walking down the aisle was so special as it was my Grandad who gave me away. It was such a lovely moment when I first saw James and I just felt at ease instantly. 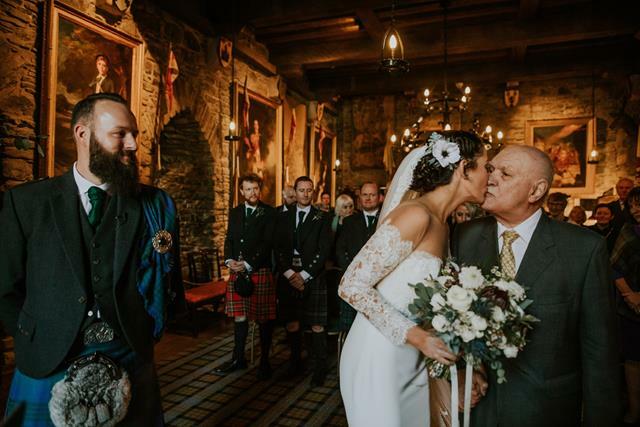 It is amazing how much of a ‘moment’ you are in during the ceremony as you just forget that there are other people around you. You are just so focussed on each other, and it is just so special. 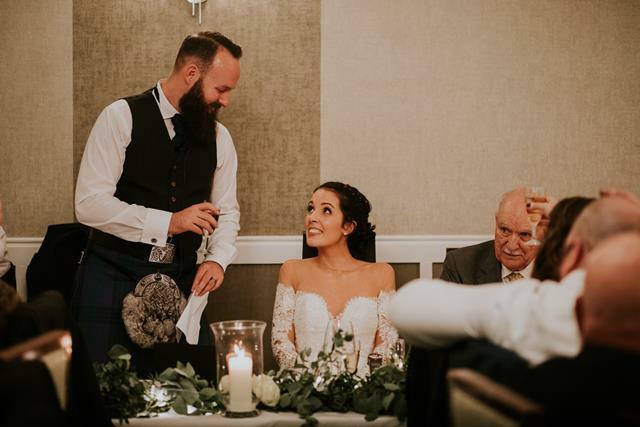 The only tears I cried was seeing my beautiful flowers being brought in and getting into my dress. To my surprise I didn’t cry at all other than that, and I thought I would be a blubbering mess! Don’t stress over the little things!! They really do not matter at the end of the day. The other thing which was the best bit of advice that I was given was to just take time out for a couple of minutes, just the two of you. Step aside from everything and just take it all in. It is true what they say about the day going by so quickly. THE WEATHER!!!! Being winter in the Highlands of Scotland we were asking for trouble! But the sun shone brightly, not a cloud in the sky, and was about 15 degrees! Another highlight was having everyone who is important to us being together. We had quite a turbulent year in that we lost 2 important members of our familes very close together. I lost my lovely Granny in June and James lost his beloved Mom 3 weeks after, very quickly. 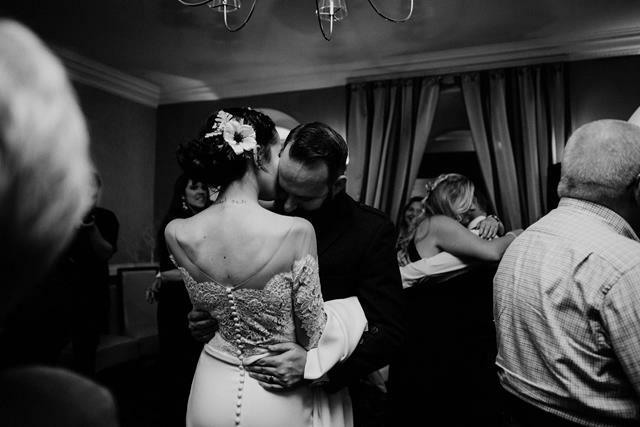 We wanted the day to be filled with so much love, which it really was. It was important to us to keep them included throughout the day. 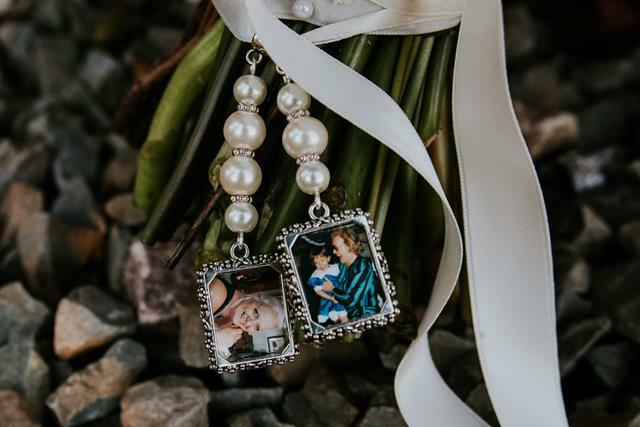 I brought some bouquet charms to tie around my bouquet which had small pictures of them both on, and also had a table set up at the hotel which had pictures of them both on, which is where I placed my bouquet.